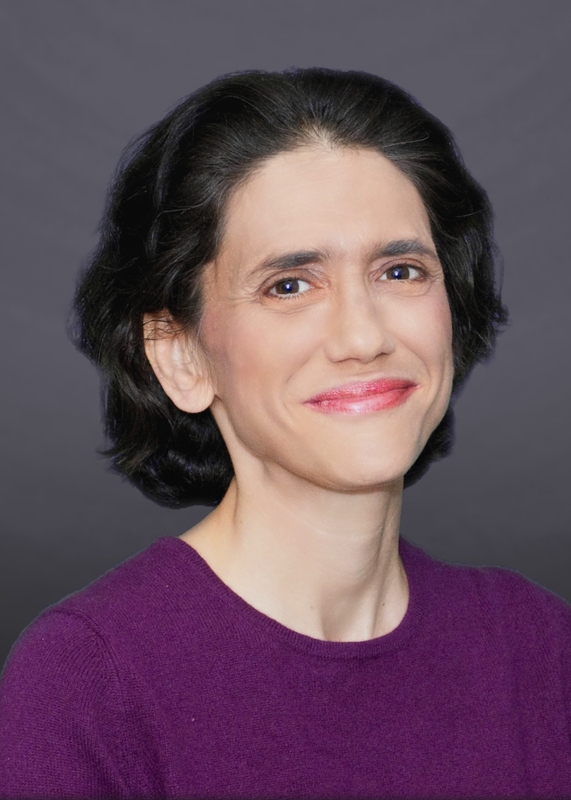 Jennifer Rubin is the controversial author of the Washington Post’s Right Turn blog, which is known for its deeply conservative take on U.S. politics as well as its promotion of militaristic U.S. foreign policies. Rubin has also contributed to a number of right-wing and neoconservative outlets, including Commentary, the Weekly Standard, Human Events, the Jerusalem Post, and Pajamas Media. Rubin was a staunch supporter of Israeli Prime Minister Benjamin Netanyahu’s controversial March 2015 address to Congress challenging President Obama’s nuclear negotiations with Iran. “Israeli Prime Minister Benjamin Netanyahu, with excessive graciousness toward his tormentor, gave a powerful, important address. His clarity and presence command our attention. When Obama sneered at a press avail that there was nothing new in Netanyahu’s remarks, he looked so very small, so very petty,” she wrote shortly after the speech. In declaring her support for Netanyahu’s speech, Rubin also purported that U.S. diplomats negotiating with Iran did not have U.S. interests in mind, but rather Iran’s. “The speech was not aimed at the president, who is immune to reason, nor to the negotiators who suffer from a variation of Stockholm Syndrome, whereby they come to identify with their bargaining opponents more than the country they represent,” Rubin opined. To build her case, Rubin cited leaked emails by White House staff allegedly expressing an intent to tailor the administration’s talking points to minimize the responsibility of the State Department—whose employees were killed in the attack—for failing to heed warnings. However, in May 2013, journalist Jake Tapper reported that ABC News and the Weekly Standard had misrepresented the contents of the emails. “[W]hoever leaked [the emails] did so in a way that made it appear that the White House was primarily concerned with the State Department’s desire to remove references and warnings about specific terrorist groups so as to not bring criticism to the department,” Tapper wrote. According to Tapper, officials were actually“trying to forge a general understanding of what the Obama administration was saying about the attack in Benghazi” in light of “misinformation” from Congress and some of the administration’s critics. Rubin has also used her Right Turn blog to venerate neoconservative figures and groups. In one entry, she discussed the work of neocon Democrat Sen. Joseph Lieberman, lauding his efforts to pressure the Obama administration on Iran (although she questioned how he would be able to “pivot” from his focus on sanctions to “a more robust approach that may include the use of force”) and Israeli-Palestinian peace, particularly his efforts to get President Obama to drop the insistence on freezing settlement growth. Rubin also sought to frame the 2014 midterm elections in the United States as ushering in Republican candidates who “ran on a tough foreign policy, opposition to the White House’s treatment of Israel, increasing defense spending and standing up to the world’s bullies.” However, exit polls revealed that only 13 percent of voters listed foreign policy as a “top issue” for them. Joe Klein, “Bigoted Religious Extremists,” Time, Swampland blog, November 7, 2009, http://swampland.blogs.time.com/2009/11/07/bigoted-religious-extremists/. Jennifer Rubin, “Morning bits,” Washington Post, Right Turn, may 22, 2011, http://www.washingtonpost.com/blogs/right-turn/post/morning-bits/2011/03/29/AFhp1b8G_blog.html. Jennifer Rubin, “Sen. John McCain gets his facts wrong on EITs,” Washington Post, Right Turn, May 13, 2011,http://www.washingtonpost.com/blogs/right-turn/post/sen-john-mccain-gets-his-facts-wrong-on-eits/2011/03/29/AFE4AS2G_blog.html. Jennifer Rubin, “Sarah Palin changes advisers, and her worldview,” Washington Post, Right Turn, May 3, 2011,http://www.washingtonpost.com/blogs/right-turn/post/sarah-palin-changes-advisers-and-her-worldview/2011/03/29/AF7jauhF_blog.html. Jennifer Rubin, “Choosing decline — again and again,” Washington Post “Right Turn” blog, December 5, 2013, http://www.washingtonpost.com/blogs/right-turn/wp/2013/12/05/choosing-decline-again-and-again/. Jennifer Rubin, “The Phony war against jihadists,” The Washington Post, January 22, 2015, http://www.washingtonpost.com/blogs/right-turn/wp/2015/03/05/dennis-ross-worried-arab-leaders-panicky/. Jennifer Rubin, “Capitulation to Cuba is par for the course for Obama,” The Washington Post, January 15, 2015,http://www.washingtonpost.com/blogs/right-turn/wp/2015/01/15/capitulation-to-cuba-is-par-for-the-course-for-obama/. Patrick Pexton, “Ombo Sauce: Advice for Jeff Bezos From the Post’s Former In-House Critic,” Washington City Paper, August 14, 2013,http://www.washingtoncitypaper.com/blogs/citydesk/2013/08/14/ombo-sauce-advice-for-jeff-bezos-from-the-posts-former-in-house-critic/. Jennifer Rubin, “Congress in revolt on Iran deal,” Washington Post “Right Turn” blog, December 10, 2013, http://www.washingtonpost.com/blogs/right-turn/wp/2013/12/10/congress-in-revolt-on-iran-deal/. Jennifer Rubin, “Who will defend the West?” Washington Post “Right Turn” blog, November 22, 2013, http://www.washingtonpost.com/blogs/right-turn/wp/2013/11/22/who-will-defend-the-west/. Jennifer Rubin, “The Iran deal makes clear it pays to enrich,” Washington Post “Right Turn” blog, November 24, 2013,http://www.washingtonpost.com/blogs/right-turn/wp/2013/11/24/the-iran-deal-makes-clear-it-pays-to-enrich/. Jennifer Rubin, “Iran explosion: An accident or a reminder?” The Washington Post, October 6, 2014, http://www.washingtonpost.com/blogs/right-turn/wp/2014/10/06/iran-explosion-an-accident-or-a-reminder/. Chris Rossini, “Jennifer Rubin’s Obsession With An Israeli Attack On Iran,” Ron Paul Institute, February 1, 2014,http://www.ronpaulinstitute.org/archives/neocon-watch/2014/february/01/jennifer-rubins-obsession-with-an-israeli-attack-on-iran/. Jennifer Rubin, “Sen. Booker ends the myth of bipartisan support for Israel,” The Washington Post. September 3, 2015,https://www.washingtonpost.com/blogs/right-turn/wp/2015/09/03/sen-booker-ends-the-myth-of-bipartisan-support-for-israel/. Jennifer Rubin, “Critics relieved that the Iran deal is absurd,” The Washington Post, July 14, 2015, https://www.washingtonpost.com/blogs/right-turn/wp/2015/07/14/critics-relieved-that-the-iran-deal-is-absurd/. Jennifer Rubin, “Looking for a world leader,” The Washington Post, March 5, 2015, http://www.washingtonpost.com/blogs/right-turn/wp/2015/03/05/looking-for-a-world-leader/. Jennifer Rubin, “What Benjamin Netanyahu just did,” The Washington Post, March 3, 2015, http://www.washingtonpost.com/blogs/right-turn/wp/2015/03/03/what-benjamin-netanyahu-just-did/. Brendan James, “Rand Slams ‘Gossipy’ Conservatives: I Gave Bibi ’50 Standing Ovations!’” Talking Points Memo, March 4, 2015,http://talkingpointsmemo.com/livewire/rand-paul-gossipy-sites-netanyahu-clap. Jennifer Rubin, “Obama’s Foreign Policy Belly Flop,” Right Turn, Washington Post, June 20, 2012. Jennifer Rubin, “Benghazi: Disaster has many parents, truth an orphan,” Washington Post “Right Turn,” May 13, 2013,http://www.washingtonpost.com/blogs/right-turn/wp/2013/05/13/benghazi-disaster-has-many-parents-truth-an-orphan/. Jake Tapper, “White House email contradicts Benghazi leaks,” CNN, May 14, 2013, http://thelead.blogs.cnn.com/2013/05/14/cnn-exclusive-white-house-email-contradicts-benghazi-leaks/. Meenal Vamburkar, Jennifer Rubin Goes Off On David Shuster For Reciting ‘Media Matters Talking Points,’ Tells CNN To ‘Mute’ Him,” Mediaite, May 19, 2013, http://www.mediaite.com/tv/jennifer-rubin-goes-off-on-david-shuster-for-reciting-media-matters-talking-points-tells-cnn-to-mute-him/. Simon Maloy, “Jennifer Rubin’s Lies Upon Lies About Benghazi,” Media Matters, February 8, 2013, http://mediamatters.org/blog/2013/02/08/jennifer-rubins-lies-upon-lies-about-benghazi/192586. 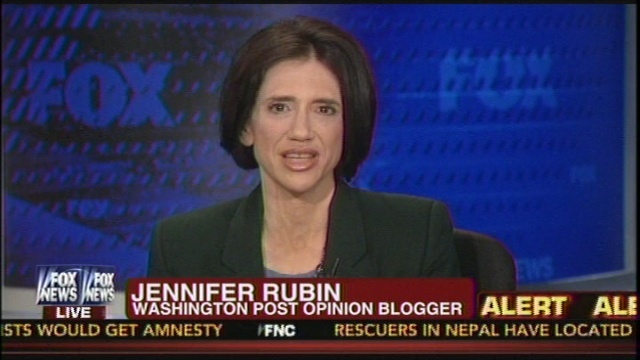 Jeffrey Lord, “Jennifer Rubin’s Romneyphilia Under Attack,” “The Spectacle Blog” American Spectator, November 18, 2011,http://spectator.org/blog/2011/11/18/jennifer-rubins-romney-philia. Jonathan Chait, “Romney Tortures Jennifer Rubin,” “Daily Intel,” New York Magazine, December 20, 2011, http://nymag.com/daily/intel/2011/12/romney-tortures-jennifer-rubin.html. Conor Friedersdorf, “The Right’s Jennifer Rubin Problem: A Case Study in Info Disadvantage,” The Atlantic, November 8, 2012,http://www.theatlantic.com/politics/archive/2012/11/the-rights-jennifer-rubin-problem-an-information-disadvantage-case-study/264942/. Jennifer Rubin, “Obama’s speech falls short,” Washington Post, Right Turn, May 19, 2011, http://www.washingtonpost.com/blogs/right-turn/post/obamas-speech-falls-short/2011/03/29/AF0YyK7G_blog.html; also “Obama double downs at AIPAC,” May 22, 2011,http://www.washingtonpost.com/blogs/right-turn/post/obama-double-downs-at-aipac/2011/03/29/AFhx9C9G_blog.html. Jennifer Rubin, “White House unhinged over Netanyahu speech,” The Washington post, January 29, 2015, http://www.washingtonpost.com/blogs/right-turn/wp/2015/01/29/white-house-unhinged-over-netanyahu-speech/. Jennifer Rubin, “Giving Iran everything it wants,” The Washington Post, February 23, 2015, http://www.washingtonpost.com/blogs/right-turn/wp/2015/02/23/giving-iran-everything-it-wants/. Jennifer Rubin, “Obama double downs at AIPAC,” May 22, 2011, http://www.washingtonpost.com/blogs/right-turn/post/obama-double-downs-at-aipac/2011/03/29/AFhx9C9G_blog.html. Quoted in Ali Gharib, “Conservative Pundit Jennifer Rubin Joins the Mainstream Media,” Columbia Journalism Review, December 7, 2010, http://www.cjr.org/campaign_desk/conservative_pundit_jennifer_rubin.php. Jennifer Rubin, “Welcome to Right Turn,” Washington Post, November 30, 2010, http://voices.washingtonpost.com/right-turn/2010/11/welcome_to_right_turn.html. Cited in Michael Calderone, “Washington Post hires conservative blogger,” Yahoo, The Cutline, November 23, 2010,http://news.yahoo.com/s/yblog_thecutline/20101123/bs_yblog_thecutline/washington-post-hires-conservative-blogger. Daniel Luban, “Will Pamela Geller Be Next ?” Inter Press Service, Lobelog, November 24, 2010, http://www.lobelog.com/will-pamela-geller-be-next/. Eli Clifton, “Washington Post ‘Conservative’ Blogger Aligned With the Pro-Israel Far Right,” Think Progress, February 5, 2011, http://thinkprogress.org/2011/02/05/jennifer-rubin-israel/. Phillip Weiss, “Is new Washington Post blogger, Jennifer Rubin, a conservative or a neoconservative?” Mondoweiss, November 25, 2010,http://mondoweiss.net/2010/11/is-wash-posts-new-commentator-jennifer-rubin-a-conservative-or-a-neoconservative.html. Jennifer Rubin, “The myth of the anti-Israel Tea Party,” Washington Post, Right Turn, December 6, 2010,http://voices.washingtonpost.com/right-turn/2010/12/the_myth_of_the_anti-israel_tea_party.html. Jennifer Rubin, “Joe Lieberman, foreign policy maven,” Washington Post, Right Turn, December 12, 2010,http://voices.washingtonpost.com/right-turn/2010/12/joe_lieberman_foreign_policy_maven.html. Jennifer Rubin, “Time to pull the plug on UN Human Rights Council,” Washington Post, Right Turn, December 2, 2010,http://voices.washingtonpost.com/right-turn/2010/12/time_to_pull_the_plug_on_the_u.html. Jennifer Rubin, “Onward, Christian Zionists,” Weekly Standard, August 2, 2010, http://www.weeklystandard.com/articles/onward-christian-zionists?page=2. Jennifer Rubin, “How and why the GOP won,” The Washington Post, November 5, 2014, http://www.washingtonpost.com/blogs/right-turn/wp/2014/11/05/how-and-why-the-gop-won/. Jennifer Rubin, “Being right about foreign policy isn’t enough,” The Washington Post, January 20, 2015, http://www.washingtonpost.com/blogs/right-turn/wp/2015/01/20/being-right-about-foreign-policy-isnt-enough/. Jennifer Rubin, “Ann Coulter, You’re No Sister Souljah,” Politico, March 3, 2007, http://www.politico.com/news/stories/0307/2971.html.